John Deere Power Systems (JDPS) will extend its generator drive power solutions with the introduction of the PowerTech PSL 13.5L prime power generator drive engine. The new engine becomes the most powerful in a line-up that meets U.S. Environmental Protection Agency (EPA) Final Tier 4 emissions regulations without the need for a diesel particulate filter (DPF). This space-saving package gives OEMs more installation options for prime power generator set applications. 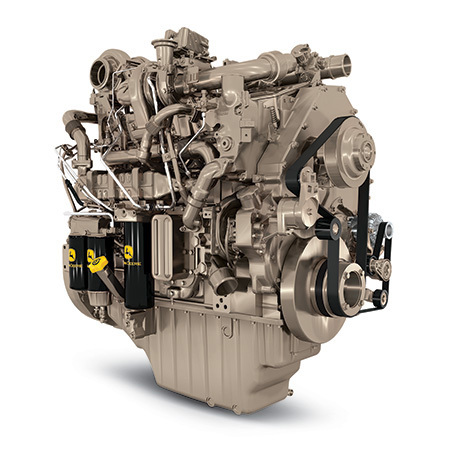 As with the other engines in the no-DPF generator drive line-up, this new 13.5L engine employs a John Deere Integrated Emissions Control system with cooled exhaust gas recirculation (CEGR), a diesel oxidation catalyst (DOC) and a selective catalytic reduction (SCR) system. "Since the introduction of our constant speed generator drive engines without DPFs earlier this year, we have been working to implement this solution in our generator drive engine line-up," said Darrin Treptow, manager, worldwide marketing for John Deere Power Systems. "With this addition we are able to offer our customers both the power ratings and performance they need for their power-gen applications." The new PowerTech PSL 13.5L generator drive engine is rated at 473 kWm and, in addition to generator sets, can be used to provide power to select constant speed applications. With low idle speeds, dual frequency ratings and easy paralleling, the engine will help customers better serve the prime power market. "Our engines are designed to perform reliably in a variety of operating conditions, making them ideal for prime power solutions," Treptow said. John Deere plans to begin production of the PowerTech PVL and PSL 6.8L generator drive engine in late 2015 while the PowerTech PSL 4.5L, 9.0L and 13.5L generator drive engines will enter production in early 2016. "Our experience working with generator set manufacturers has helped us better understand the features and services necessary to meet today's challenges. We think our PowerTech engines meet those challenges by offering our OEM customers compact generator set packaging, easy operation and reliable performance," Treptow said. John Deere offers an extensive line-up of standby and prime generator set engines that meet emissions regulations while delivering quick-starting, clean-running and fuel efficient performance. The full line-up of John Deere generator drive engines ranges in displacement from 2.9L to 13.5L and covers generator drive ratings from 31 to 563 kWm (42 to 755 hp). These engines include non-emissions certified, EU Stage II and Stage III A, EPA Tier 3, Interim Tier 4 and Final Tier 4 models.